Use the beer you are drinking to make this dish and you will surely enjoy every last bit. I would warn you, buy some bread or make some fries because you will want every drop of the cooking liquid. Of course you can always just tip the bowl up and drink it! I really enjoy the Midas Touch by Dogfish head with this dish. It is dry and sometimes recommended for the Chardonnay drinker. Perfect for seafood and butter. 1. Begin by melting your butter over a medium heat in a pan large enough to hold all of the mussels. Once it is bubbling a bit add your minced garlic until you can really smell its aroma. Then dump in your mussels. Shake them around a little get them settled. 2. After about 2 minutes pour in the beer and let them things rock until they have all opened. I like to reduce the beer by about half before I begin to add the butter. 3. Now adding a little at a time begin to add the butter to your pan. 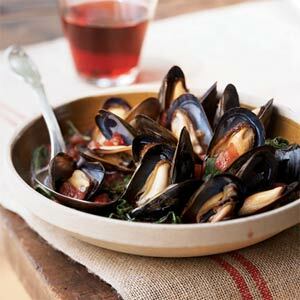 You can remove the mussels for this part and set them in the bowl. It makes it much easier. add the butter a little at a time until all you see is butter sauce in the pan. 4. Finish by just tossing your thyme in there and let it linger off the heat and permeate the sauce. Then find some fries!